On November 5, 1937, Adolf Hitler held a conference at which many leaders were present. The men who attended were sworn to secrecy, being told that the informtation to be discussed was of severe vitality. Hitler thereby began to expalin his plans for war in Europe, and identified that in the event of his death, his statements at the conference should be considered his last will and testament. In a shockingly blunt way, the Fuhrer openly admitted that his desire was war, a subject he concealed in public. This conference was used later as a primary source of evidence in the trials of German soldiers charged with crimes against humanity. It is known as the Hossbach Memorandum. "The Eternal Jew" Exhibition Opens! 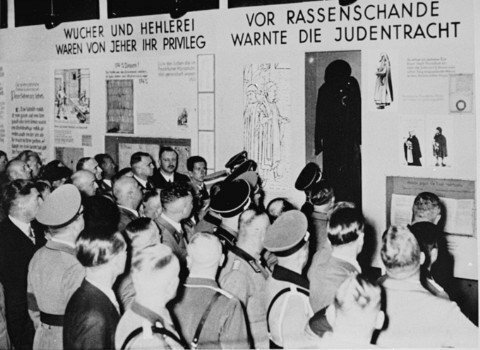 This exhibition was a form of propaganda used by the Nazis in shwoing people the "danger" presented by the Jews. At left, Nazi officers view the display for the first time on November 8, 1937. The title at the righ is entitled "Jewish dress was a warning against racial defilement." To the left of that is another segment that states "Usury and the fencing of goods were always their privilege." Nazi miinister of propaganda, Joseph Goebbels, later produced a film of the same name, "Der Ewige Jude". In the film, he used footage of Jews suffering in the Warsaw ghetto while interrupting them with scenes of rats. The purpose of the production was to show that Jews "differ from us in body, but especially in soul."